It was 198 years ago today that a lawyer named Francis Scott Key witnessed a large American flag being raised above Fort McHenry following a successful defense of Baltimore against the British during the War of 1812. As he watched the events unfold in the early morning sun of September 14th, he penned a poem that reflected what he witnessed as the Americans bravely defended Fort McHenry from a brutal British bombardment that began the day before. The popularity of the patriotic song grew throughout the 18th century and by 1917 the army and navy both designated it the national anthem for all official ceremonies; thus began a movement to make the tune our official national anthem. On March 3, 1931, President Herbert Hoover signed a bill previously passed by Congress into law, finally making “The Star Spangled Banner” our national anthem. We all listen to and sing that song without actually thinking much about the words contained in it and what it is about, so I urge you all to stop and really listen to the words the next time you hear the anthem played and visualize the picture Francis Scott Key painted for us those many years ago. 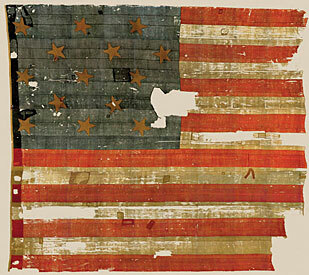 For those interested in what happened to the actual flag that was raised over Fort McHenry “by the dawn’s early light” on September 14, 1814, not to worry…it’s at the Smithsonian, of course. Be sure to check back in with us on Monday as it is not only Constitution Day, something we certainly celebrate around here every year, but this year just so happens to be the 225th anniversary of the approval of the U.S. Constitution by the delegates of the Constitutional Convention in 1787, which is an occasion that should not be overlooked by any American. See you soon!